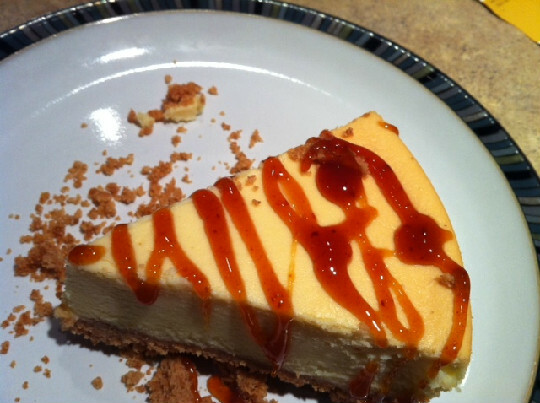 Boiled cider is a FANTASTIC cheesecake topping. FYI. Confession: I love me some autumn. This is my favorite season… ever. It’s got cool sunshine and low humidity; sweaters, cute jackets and jeans; and oh, the food! Apples and pears, pot roast and soup, tomatoes and squash and pumpkin and cranberries. It’s pretty much the perfect season. And, to celebrate the greatness of autumn, I just discovered a thing called Boiled Cider. This is actually a very old-fashioned syrup-type product that’s made from apple cider. It used to be super-popular, especially along the east coast, but has really fallen by the wayside. UNTIL NOW. I’m telling you, I’d like to start a boiled cider renaissance. This stuff is like autumn, in edible form. Now that I know it exists, my life is forever changed, for the better.